Acosta, H., J. Cavelier, and S. Londoño. 1996. Aportes al conocimiento de la biología de la danta de montaña, Tapirus pinchaque, en los Andes Centrales de Colombia. Biotropica 28:258-266. Downer, C. C. 2001. Observations on the diet and habitat of the mountain tapir (Tapirus pinchaque). Journal of Zoology 254:279-291. Flesher, K. 1999. 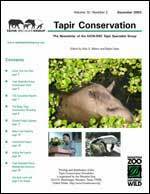 Preliminary notes on the conservation status of Baird´s tapir Tapirus bairdii in north-eastern Honduras. Oryx 33:294-300. Foerster, C. R., and C. Vaughan. 2002. Home range, habitat use, and activity of Baird's tapir in Costa Rica. Biotropica 34:423-437. Fragoso, J. M. V., K. M. Silvius, and J. A. Correa. 2003. Long-distance seed dispersal by tapirs increases seed survival and aggregates tropical trees. Ecology 84:1998-2006. Fragoso, J. M. V., and J. M. Huffman. 2000. Seed-dispersal and seedling recruitment patterns by the last Neotropical megafaunal element in Amazonia, the tapir. Journal of Tropical Ecology 16:369-385. Galetti, M., A. Keuroghlian, L. Hanada, and M. I. Morato. 2001. Frugivory and seed dispersal by the lowland tapir (Tapirus terrestris) in southeast Brazil. Biotropica 33:723-726. Henry, O., F. Feer, and D. Sabatier. 2000. Diet of the lowland Tapir (Tapirus terrestris L.) in French Guiana. Biotropica 32:364-368. Holden, J., Achmad Yanuar, Deborah J. Martyr. 2003. The Asian Tapir in Kerinci Seblat National Park, Sumatra: evidence collected through photo-trapping. Oryx 37:34-40. Lira-Torres, I., E. J. Naranjo-Piñera, D. M. Güiris-Andrade, and E. Cruz Aldán. 2004. Ecología de tapirus bairdii (perissodactyla: tapiridae) en la reserva de la biosfera el triunfo (polígono i), chiapas, méxico. Acta Zoologica Mexicana 20:1-21. Lizcano, D. J., and J. Cavelier. 2000. Daily and seasonal activity of the mountain tapir (Tapirus pinchaque) in the Central Andes of Colombia. Journal of Zoology, London 252:429-435. Lizcano, D. J., and J. Cavelier. 2000. Densidad poblacional y disponibilidad de habitat de la danta de montaña (Tapirus pinchaque) en los andes centrales de Colombia. Biotropica 31:165-173. Lizcano, D. J., V. Pizarro, J. Cavelier, and J. Carmona. 2002. Geographic distribution and population size of the mountain tapir (Tapirus pinchaque) in Colombia. Journal of Biogeography 29:7-15. Naranjo, E. J., and E. Cruz. 1998. Ecologia del tapir (Tapirus bairdii) en la Reserva de la Biosfera la Sepultura, Chiapas, Mexico. Acta Zoologica Mexicana 73:111-125. Naranjo, E. J., and C. Vaughan. 2000. Ampliacion del ambito altitudinal del tapir Centroamericano (Tapirus bairdii). Revista de Biologia Tropical 48:724. Norton, J. E., and M. V. Ashley. 2004. Genetic variability and population structure among wild Baird's tapirs. Animal Conservation 7:211-220. Norton, J. E., and M. V. Ashleyn. 2004. Genetic variability and population differentiation in captive Baird’s tapirs (Tapirus bairdii). Zoo Biology 23:521-531. Padilla, M., and R. C. Dowler. 1994. Tapirus terrestris. Mammalian species:1-8. Rodrigues, M., F. Olmos, and M. Galetti. 1993. Seed dispersal by tapir in southeastern Brazil. Mammalia 57:460-461. Salas, L. A. 1996. Habitat use by lowland tapir (Tapirus terrestris L.) in the Tabaro River valley, southern Venezuela. Canadian Journal of Zoology 74:1452-1458. Salas, L. A., and T. K. Fuller. 1996. Diet of the lowland tapir (Tapirus terrestris L.) in the Tabaro River valley, southern Venezuela. Canadian Journal of Zoology 74:1444-1451. Tirira, D. 2004. Nombres de los mamiferos del Ecuador. Ediciones Murcielago Blanco y Museo Ecuatoriano de Ciencias Naturales. Publicacion especiel sobre los mamiferos del Ecuador 5. Quito. Pag. 152-154. Trim, C. M., N. Lamberski, D. I. Kissel, and J. E. Quandt. 1998. Anesthesia in a Baird's Tapir (Tapirus bairdii). Journal of Zoo and Wildlife Medicine 29:195-198. Tobler, M. W. 2002. Habitat use and diet of Baird's tapirs (Tapirus bairdii) in a montane cloud forest of the Cordillera de Talamanca, Costa Rica. Biotropica 43:468-474. Barongi, R., 2000. Criterios para el Manejo de Tapires en Cautiverio. Guias de la Asociacion Americana de Zoologicos y Acuarios.